My mother Elizabeth Ellerby nee Scholes, lived in “Primrose Cottage”, Haywick Drive, Primrose Hill, Langdon Hills. She married Ronald Ellerby in 1947. 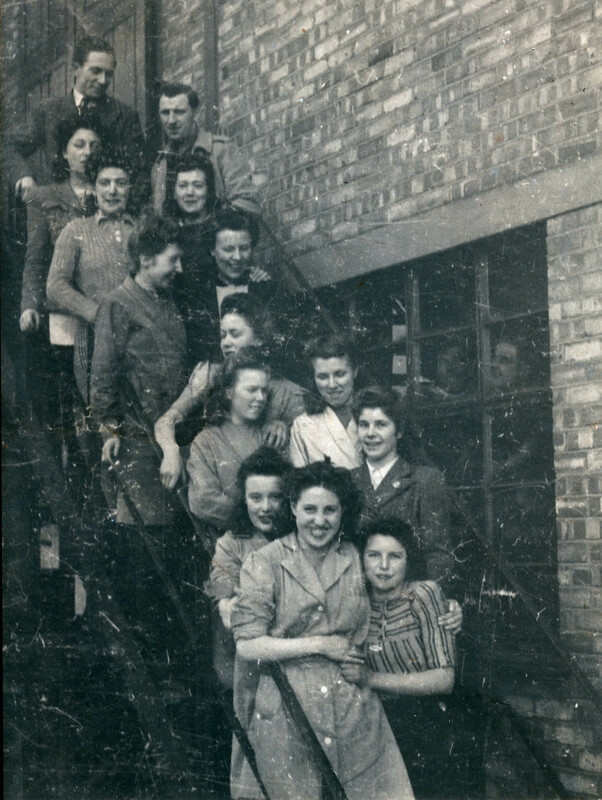 She worked during the mid to late 40s at both the Dartboard and Bon Bon factories on the A127 at Laindon. 1 _____? 2 _____? 3 _____? 5 Joan Short 6 _____? 7 _____? 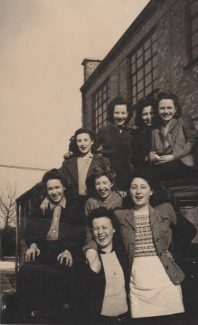 Above photograph shows her work colleagues at the side of the Bon Bon Factory which was the last one of the group of buildings on the south side of the London Bound carriageway of the Arterial Road. 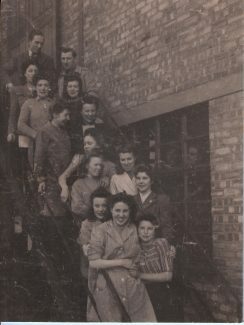 As she took this picture she does not appear in the photo but does anybody recognise any of the local faces? At this time Elizabeth was also known as Sis to her work mates and always mentioned how much she enjoyed the work and how friendly her fellow workers were during her time at the factories. 1 Grace Medcalf ______? 2 _____? 3 _____? 4 ______? 5 Elizabeth Ellerby 6 ______? 7 ______? 8 _____? 9 Joan Short 10 _____? 11 _____? 12 _____? This photo is looking west beside the same factory. My mother Elizabeth is the second from the right in the back row with the lovely smile. 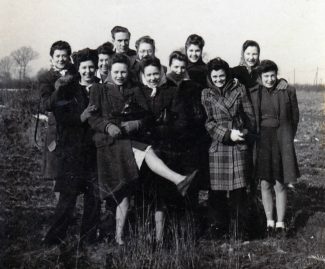 The fields behind the staff is the surrounding land on which Fords later developed the Dunton Research Centre, the building of this facility started in 1965 and opened in 1967. Note the old telegraph poles on the right hand side of the photo lining the A127 main road. I do hope some of the faces are familiar so we can put names to the staff. My sister in law Grace Medcalf worked at the cracker factory. She is the First Lady in front of the man on the right hand side, coming down the stairs. Her mother made crackers at home for years and I think they lived on King Edward estate. Yes Alan, Morris is my uncle but it was not him that got killed it was his brother Peter. Morris is still living in Basildon and very much alive. Barry, are you kin to Maurice (or Morris) Ellerby? On a very sad day in 1940-42 I was walking along the High Road to where my mother worked at the British Restaurant which was held in the Memorial Hall. A large crowd had gathered approximately between O. Shedd and Relph’s the chemist. About to cross over and investigate, I bumped into Margaret a close friend of my aunt Rose. They were in the Land Army together. Margaret told me not to join the crowd but to walk on by on the opposite side of the road. I did so. It was only later that I discovered that Maurice Ellerby had been hit by an army truck. I believe he was killed. While he was not in my class we were both attending Langdon Hills School at the time. Very sad. Joan Short again in the third photograph. Seventh up from the bottom. I was pretty sure No. 5 in the top photo and No. 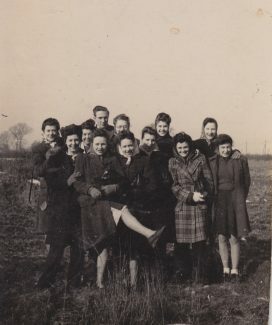 9 in the bottom photo is Joan Short (known as Joanie), the older sister of my sister Anne’s school friend Sylvia Short. So I e-mailed Sylvia and have just received her reply. She has confirmed that it is her sister Joan. Joan doesn’t do computers, so Sylvia will take the photos along to show her and is pretty sure she will know all the other names. The Short family lived in a bungalow called ‘Artillery View’, off Devonshire Road, very close to our bungalow ‘Spion Kop. (See my sister Anne’s article “The Short Family of Artillery View”, The story of a childhood friendship). There is a photograph of Joan in the 4th photograph down. Our bungalows were just across the field that led to the Cracker Factory, the very field where more new houses are going to be built. I’m pretty sure that Joan would have walked across that field to get to work rather than walk all the way down King Edward Road, along the High Road and then along the A127 – a very long way round. When I was a child in the fifties, those fields were absolutely beautiful. I will be back as soon as I hear further from Sylvie, when hopefully we will be able to fill in all the names.